In Sutton Coldfield local historians have been fortunate to have access to the research collections held in the local history section of Sutton Coldfield Library. The Local History Research Group recently celebrated 25 years of research, members are still bringing to light aspects of the history of our town, and there is enough material to keep us busy for the next 25 years. The library is closed at present, but research often takes members to consult archives elsewhere, - for example, deeds relating to New Hall Mill are in the Record Offices at Nottingham, Stafford and Lichfield - and we often come back with photocopies of documents to add to the library’s collections. One such document, which was discovered by Janet Jordan in a private collection at Stoke-on-Trent, is a record of local Sutton events in the 1800s kept by a Sutton lady, Sarah Holbeche. 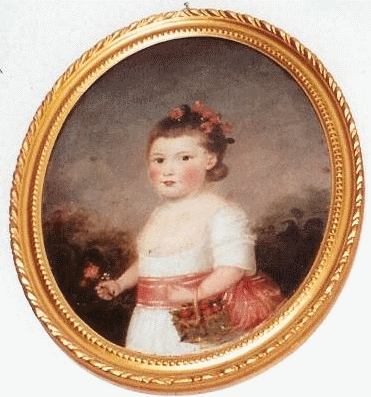 Also in this private collection was a miniature portrait of Sarah Holbeche’s mother as a young child, when her name was Sarah Gamble. Intrigued, attempts were made to find out more about the Gamble family (Francis Gamble was Warden of Sutton Coldfield in 1779). As is often the case, much research yielded only a little fruit, and Janet was left to wish that the portrait could speak -“what stories she could tell us - but her lips remain silent”. “A bit of a Gamble” by Janet Jordan is published in the latest volume of the Research Group’s “Proceedings”. This volume is volume nine of a series containing the results of members’ research; it includes articles on two old Sutton houses, two wars, two families, and a charismatic madman, and covers over three centuries of our history. Proceedings used to be available from local bookshops, but now the national chains will not stock our humble publications, so if you would like to obtain a copy (it costs £5) you should order if from me, Roger Lea, 210 Dower Road, B75 6SZ.